Today you’re hearing from John Organ, the head of our Northeast Region Wildlife and Sport Fish Restoration Program. The program oversees many federal grant programs to support fish, wildlife, their habitats, and the hunting, sport fishing and recreational boating opportunities they provide. John has made two visits to Peru to advise their forest and wildlife programs. 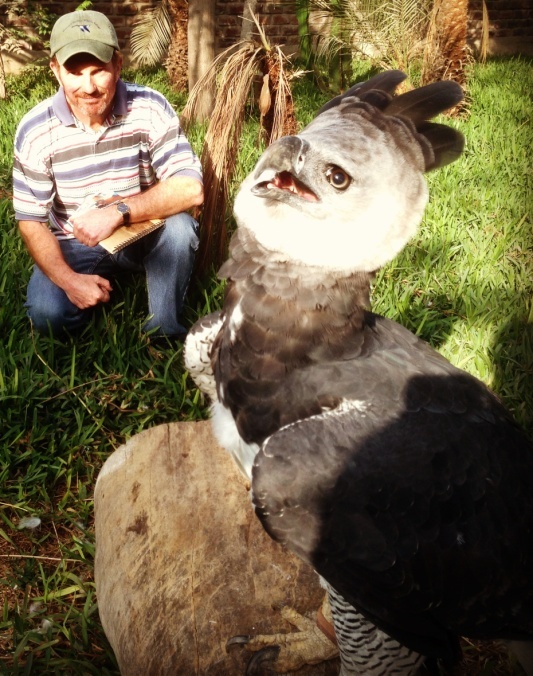 Here he’s pictured in Peru with a harpy eagle, the world’s largest eagle. Photo courtesy of John. I went to a market in Lima, Peru, and bought a can of Pringles. I wasn’t looking for a snack. I was looking for an inexpensive tool to help Peruvian biologists estimate wildlife habitat. The wildlife crews I work with cannot afford a spherical densiometer, a tool that measures tree canopies and averages more than $100. So in the lunch area of the Peru Forest Sector Initiative office, I emptied the Pringles can, punched a small hole in the bottom and drew a grid on the transparent plastic cover with a Sharpie, and voila – a sampling tube. Why Peru? The U.S. Forest Service International Programs and the Peru Forest Sector Initiative invited me in August 2012 and again in May 2013 to help them implement the country’s new forest and wildlife law. I looked at this as a real treat – and a challenge. My two major objectives for this trip were to first work with the federal agencies and regional governments to develop regulations to implement the law, and second, to develop field protocols for wildlife inventory work and train biologists in their application. Over a period of two weeks during this latest trip, I worked with the Peruvian wildlife agencies on policy and regulation, partnership, wildlife and habitat inventory and data collection, and outreach with indigenous peoples. I also gave a lecture to faculty and graduate students at La Molina National Agriculture University, the principal forestry and wildlife school in Peru. Peru boasts the second largest area of the Amazon rainforest, a desert coast and the Andes Mountains. Known as one of the world’s “megadiverse” countries, Peru hosts about 25,000 species of plants and animals, and around 6,000 of those are found only here (link to CBD). . The Peruvian government has strived to protect its natural heritage. Illegal hunting and logging and other challenges to sustainable forest management continue to present a significant threat to Peru’s forest ecosystems, particularly in the Amazonian regions. Photo from Creative Commons, Flickr user Global Water Forum. The most glaring difference for wildlife management in Peru and the U.S. deals with wildlife ownership. In the U.S., our public trust doctrine is the common law that establishes wildlife resources are owned by state and federal government to hold in trust for the benefit of current and future generations of all Americans. 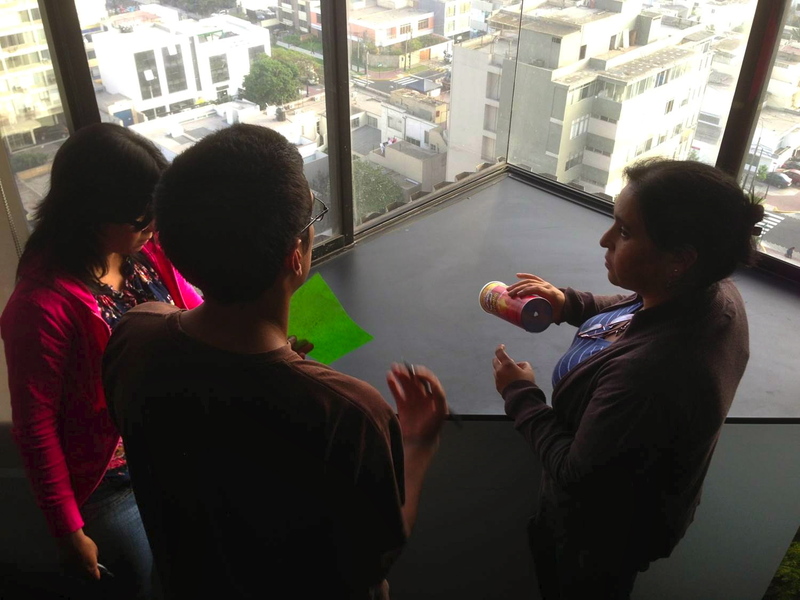 In Peru, the responsibility historically has been, by default, centralized out of Lima, the capital, for over 500 years. This new law attempts to decentralize authority, and since there is no clear statement of ownership various federal agencies and regional governments have vied for authority over provisions in the law, which allows the government to grant concessions over land to private interests who will control it for forest and wildlife. I also provided an intergovernmental group with examples of North American partnerships and coordination for the recovery of endangered species and the implementation and monitoring of sport hunting programs. Now, back to the Pringles can. Biologists adapting the Pringles can for a sampling tube. Photo courtesy of John. I wanted to help the Peruvian wildlife agencies ensure that the commercialization provided for in the law does not compromise biodiversity conservation. To do that, I stressed the need for their biologists to gather data on wildlife in conjunction with the forest inventory survey work that is being implemented. They began to focus on recording direct observations of target plants and animals, with the notion they could determine presence or absence. I emphasized that the limitations they would be confronted with in terms of logistics would prevent them from determining presence and absence with any rigor, and suggested wildlife habitat structural data would be more appropriate. Using target species where some knowledge exists about species/habitat relationships, they could model or predict potential species use, and incorporate the direct observational data as appropriate. John and the policy group for the Peru Forest and Wildlife Service. Photo courtesy of John. John standing by a giant Renaco tree. Photo courtesy of John. John standing with Director General Rosario Acero of the Peru Forest and Wildlife Service. Photo courtesy of John. Field crew in Ucayali. The two on the left, Elias Gil and Juan Vargas, are “Materos” – trail openers. Photo courtesy of John. The intergovernmental group responsible for wildlife regulations. Photo courtesy of John. John standing with Oseas Barbaran, the president of the Confederation of Amazon Nationalities of Peru. Photo courtesy of John. My goal is for the Forest and Wildlife Service to use this to see how potential species occupancy is addressed by those who manage the land. For example, if a concessionaire manages more for commercial species, that will likely have a negative effect on the preservation Peru’s unique biodiversity. Biologists incorporated my Pringles can adaptation, budgeting for 20 cans, and other tools I introduced to them, such as a cover pole for estimating horizontal cover, and we developed a field sampling manual with instructions for how to conduct the wildlife and habitat inventories. I even got to test some of the field techniques in the Ucayali Region of the Peruvian Amazon. The diversity of plant and animal life in the Amazonian forests is truly incredible. 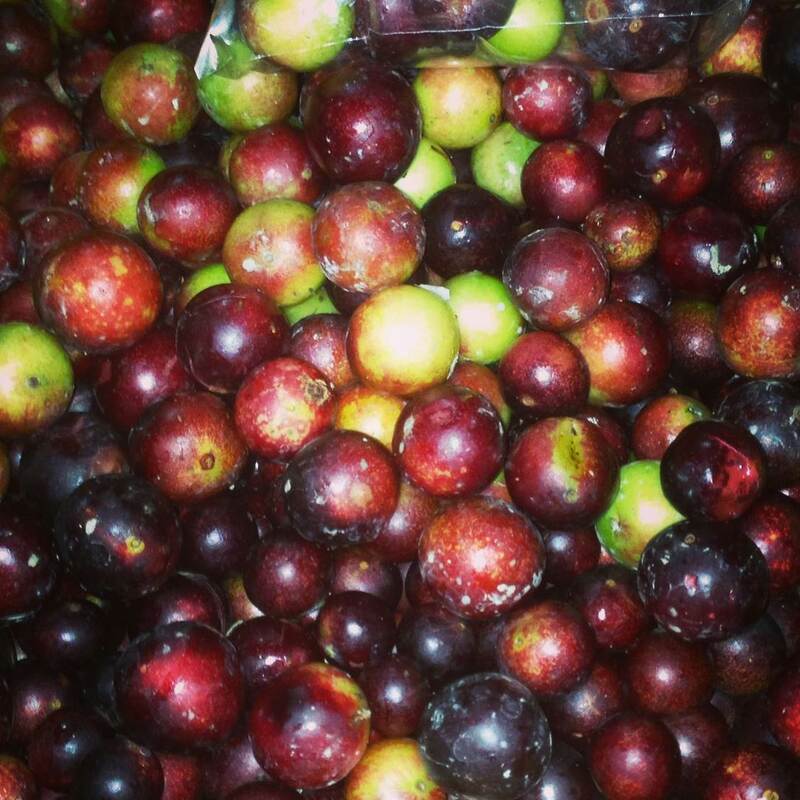 Camu camu berries have the highest concentration of vitamin C of any food in the world. It is found on a small bushy riverside tree from the Amazon rainforest vegetation in Peru and Brazil. Photo courtesy of John. While I was only out in the jungle for a short time, many biologists will be living out in the wild for a month at a time to gather data. To ensure the villages would not be surprised by the arrival of these inventory crews, workshops were planned in the different regions of the Amazon. I met with the Shipibo-Comibo, many of whom traveled by water for days from their remote villages to attend the meetings. I will be returning to Peru this month to continue the work on the regulations and to train biologists in the San Martin region of the Amazon. Next month we will be hosting a contingent of Peruvian federal and regional wildlife administrators and biologists, showing them how the Service collaborates with partners and taking them to some of our National Wildlife refuges and State Wildlife Management Areas. With so much of the world’s biodiversity centered in Peru, much is at stake. It is a privilege to be able to work with people in such an amazing land, and become familiar with their wonderful culture. I am hopeful we are laying the groundwork to ensure Peru’s wildlife heritage will be secure for generations to come. This entry was posted in Blog entries, Partnerships, Science and research and tagged abroad, amazon, andes, conservation, densiometer, foreign wildlife conservation, forest service, peru, peru forest and wildlife, peru forest sector initiative, pringles, rainforest, sampling tube, usfs, usfws on August 23, 2013 by usfwsnortheastblog.